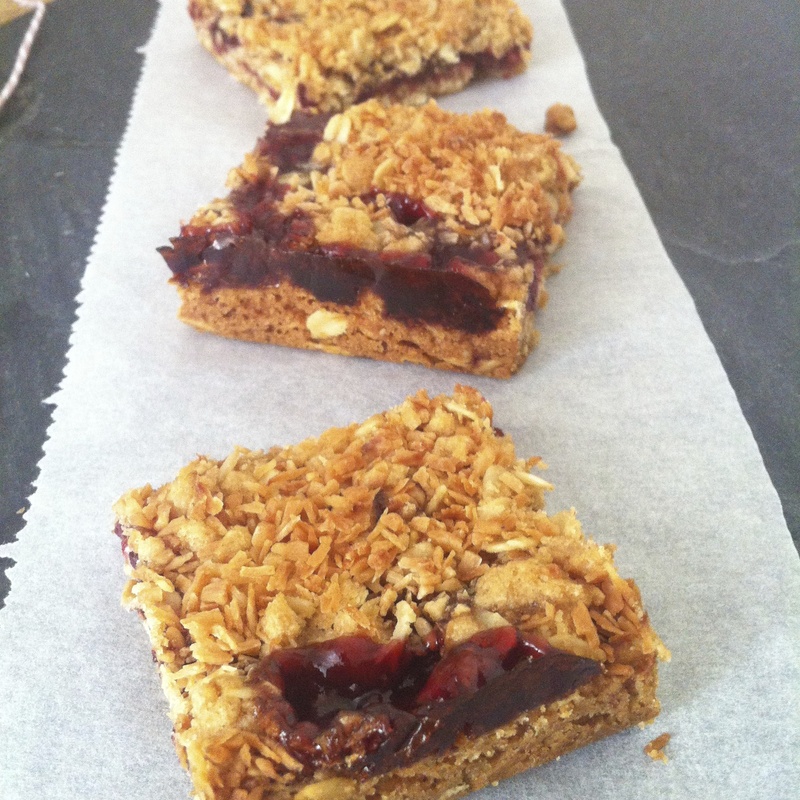 This entry was posted in Baking, Fiesta Friday, Recipe and tagged after school snack, bake sale, coconut, easy, hostess gift, jam, make with children, oat slice, slice, sour cherry jam. Bookmark the permalink. Thanks Justine and thank you for co-hosting too! Sorry didn’t make it down to the fair today – I had other commitments and just couldn’t squeeze it in – London is just too big sometimes! Hope you had a great day though! Thank you so much – they did not last long! It sure is!! Getting all fancy pants is a ‘thing’ y’know! Thank you Karen – they are very easy! Looks delicious, and I have a feeling it tastes just as good as it looks! 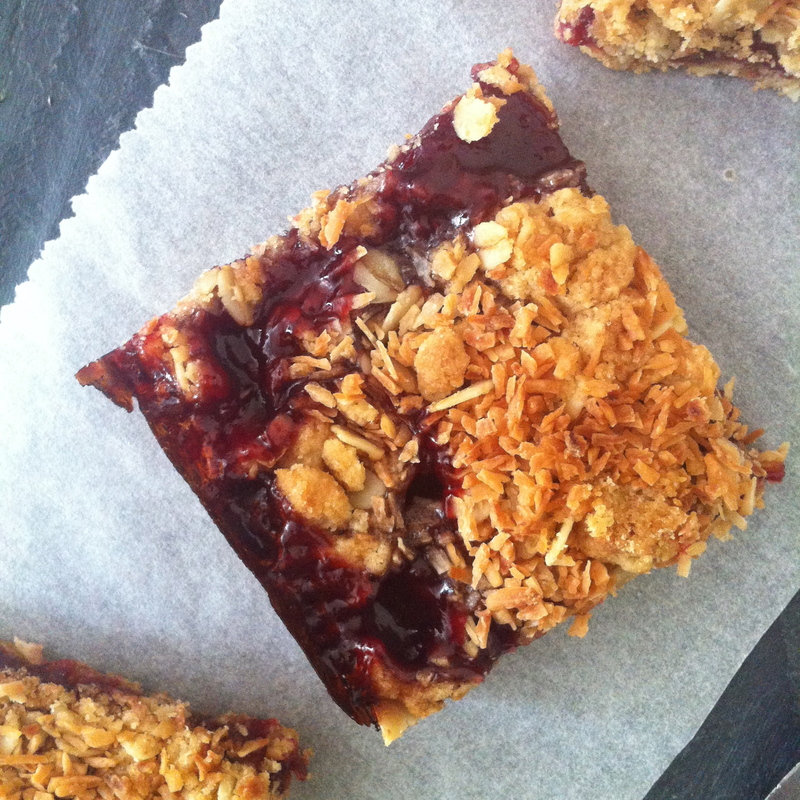 Thanks Julianna – there is something very comforting about coconut and oats – probably harks back to a granola or something! I love coconuts, and I love sour cherries. This is a winner, Selma! Thank you June – sometimes the simplest things are just the best. Thanks – yes, the bits where the jam oozed through were also the ones that got fought over at the table! Thanks Bubbles! So nice to be here and have you co-hosting too! I have brought the camomile tea with me, just in case….Thanks for co-hosting Jhuls and Happy Fiesta Friday! Thanks Sonal – they were irresistible! Wow selma! These look delicious!! Yum! Thanks so much! Happy Fiesta Friday! These bars look amazing. I am seriously craving one right now! Julie, me too – in fact, the other night, I thought I would have a little treat, opened the tin and found crumbs…#livingwithteenagers! 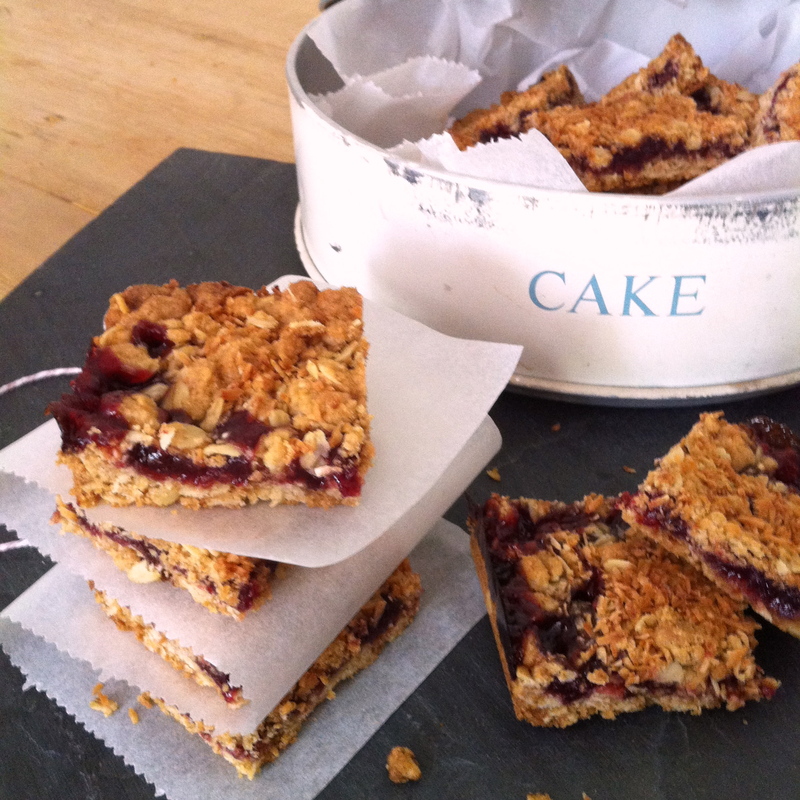 Looks absolutely delicious Selma, I love the sour cherry jam peaking through the tops, yum! Yes, and Jake made a bee-line for those first! Thanks so much Kaila – Happy Fiesta Friday to you too! 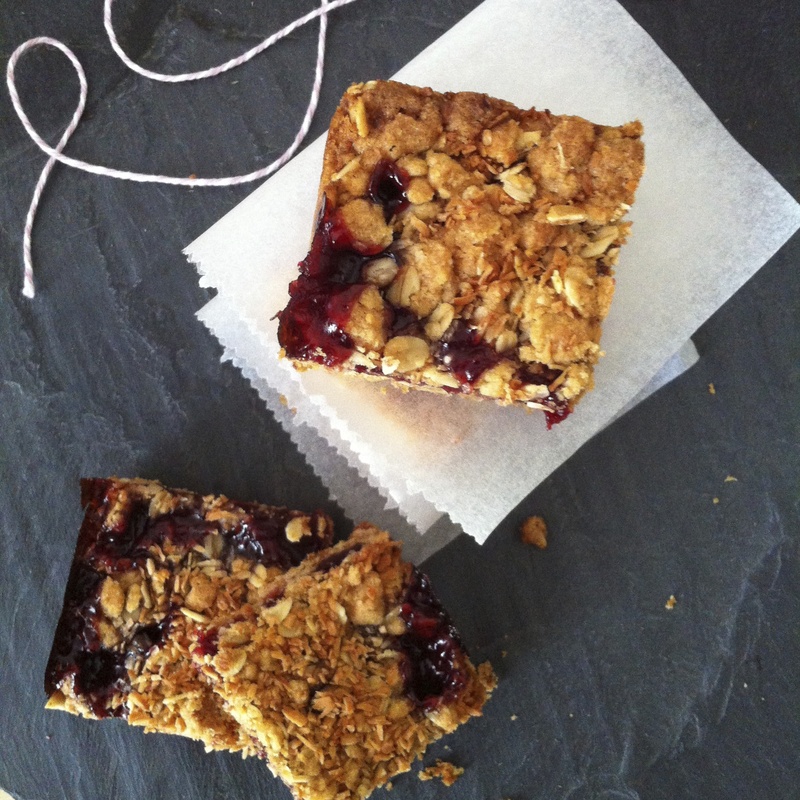 These look great, I love the sound of the cherry jam in there along with the oats. Thanks so much – loved your banana blondies too! These look awesome! I’ve made something somewhat similar with fig jam before – gonna have to hunt out that sour cherry preserve though, it looks awesome. Don’t think we have a lidl by me though (we have 2 aldis though, whats that all about?!). Thanks Michelle! An ice-cream cocktail sounds perfect!! Aldi’s Grandessa jams do really well in the taste tests – have a look at this http://www.supermarketownbrandguide.co.uk/search.php?table=jam&page=1 Sounds like the raspberry or blood orange marmalade would work well too! These look absolutely scrumptious , Selma! 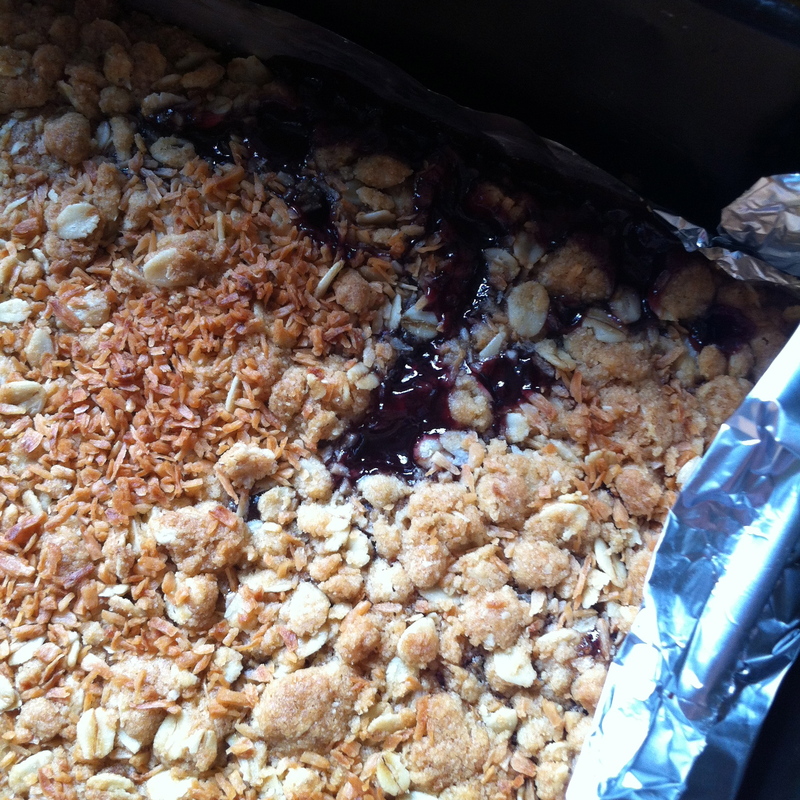 Ohhh I love the step by step pictures, that gooey cherry has my stomach growling!!! I’m glad that it’s kid friendly too… not so much for kids, but for me! ha! Thanks Lili – and do get your niece to have a go! Slowly getting back in the “blogging grove” Selma, and I’m glad I stopped by. 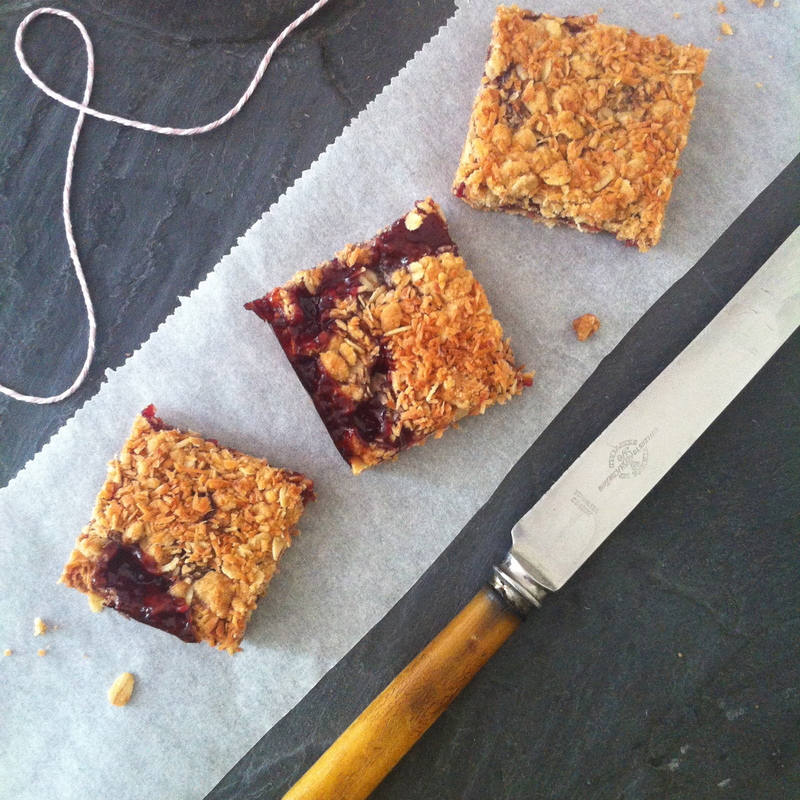 These sour cherry, coconut and oat slices are just the perfect treat for any day. Would love to share this with a cup of coffee or green tea. I hope London is treating you well these days? Thanks Loretta – yes, all well here; even the weather has not been too bad. Glad to hear that you are getting your groove back! 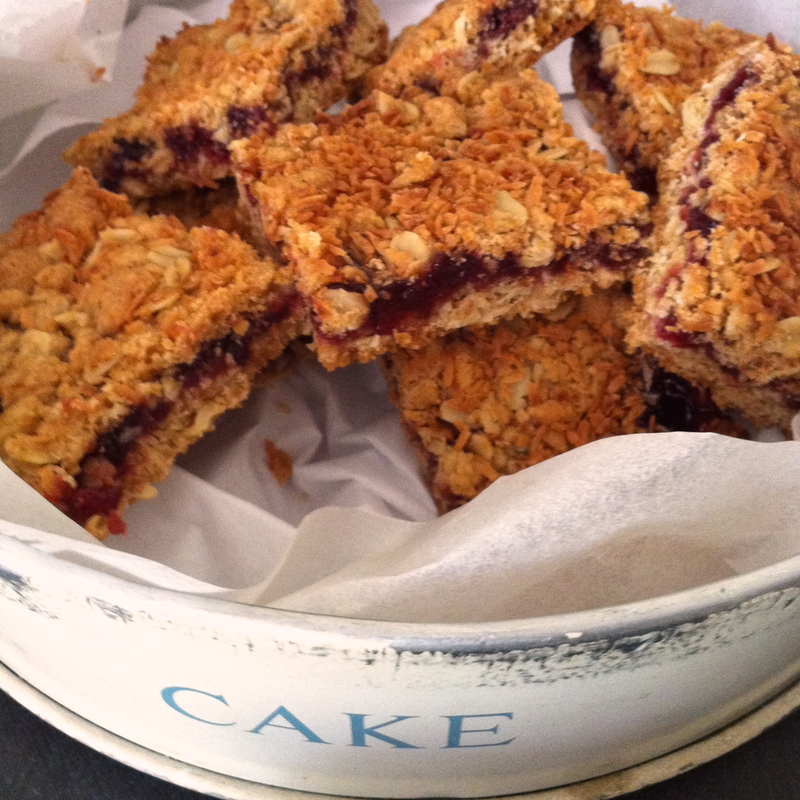 These look like the perfect way to use up some of my huge jam stash, thanks Selma!